Submission of your order constitutes acceptance and acknowledgment of the site's terms and conditions of sale. Order acceptance via Authorized Company PO is subject to payment verification prior to order fulfillment. We cannot accept any return or exchanges without prior authorization. We honor return/exchange requests made WITHIN 30 DAYS of the original sale date. Custom signs cannot be returned or exchanged unless they are damaged or defective. Shipments to some states require sales tax charges unless a non-profit or re-sale certificate is noted with this order. Orders will be delayed if sales taxes apply and are not included in the order total. We collect sales tax in states where online tax collection laws apply to remote sellers (list below). ALASKA, HAWAII, CANADA and other non-Continental US shipments: Additional shipping charges may apply. Our Service Team will contact you upon ordering to coordinate shipping details. Questions on APO/FPO, Canada or other International Orders, select GLOBAL here. 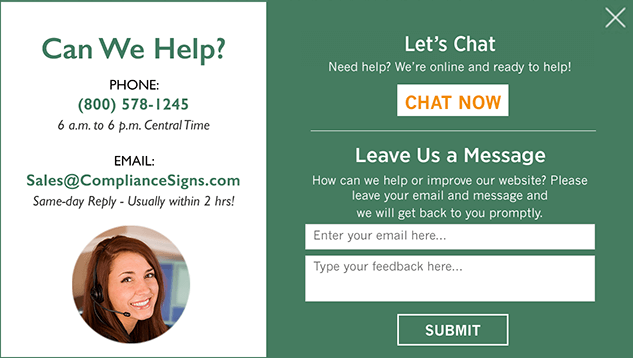 Thank you for visiting the ComplianceSigns.com® website. Please take the time to review our terms and conditions section. Please know, that by accessing, transmitting or downloading information from this site, you agree to comply with and be bound by these terms and conditions. Although ComplianceSigns.com has attempted to provide accurate information on this web site as a service to you, the user, ComplianceSigns.com assumes no responsibility for, and makes no representations with respect to the accuracy of the information. ComplianceSigns.com reserves the right to add, modify or delete any content from the web site, including the terms and conditions, at any time, without prior notice. Customer Service: If you have any questions about your order or about an item, please call us during our regular business hours. Orders are processed in order they are received. Normal processing time is two business days. Upon verification and approval of payment, your merchandise will be shipped out as soon as possible. Shipping transit time is dependent on the level of service you select. Additionally, processing & shipping times do not include non-business days (i.e., Saturdays, Sundays, & holidays). IF YOUR ORDER IS ESPECIALLY URGENT, WE STRONGLY RECOMMEND CONTACTING US DIRECTLY SO THAT WE MAY EXPEDITE SHIPPING. We reserve the right to contact you if you submit a custom sign that we feel includes objectionable material. We will either jointly modify the content or we will promptly refund your money and cancel the order. We also reserve the right to act on objectionable material submitted to us. ComplianceSigns.com has stringent policies when it comes to credit card screening and is dedicated to protecting our customers from credit card fraud. To protect the security of your credit card and help expedite your order, if your order is shipping to an address that is not the same as the billing address on your credit card, you may be asked to list the alternate address with your credit card company. Note: Your receipt of an electronic or other form of order confirmation does not signify our acceptance of your order, nor does it constitute confirmation of our offer to sell. ComplianceSigns.com reserves the right at any time after receipt of your order to accept or decline your order for any reason. We may require additional verifications before accepting any order. ComplianceSigns.com site offers secure credit card payment through FirstData, a premier gateway processing service. We take precautions to protect your information. When you submit sensitive information via the website, your information is encrypted and transmitted and stored in a secure way. Only authorized employees are granted access to personally identifiable information. The computers/servers in which we store personally identifiable information are kept in a secure environment. Payments can be made by credit card via our online shopping cart service, telephone order, email, or fax. We currently accept Visa, MasterCard, AMEX, and Discover. There is no additional charge for credit card payments. Online Payments can be made from the website. Contact our Customer Service Department for alternate payment options. ComplianceSigns, Inc. collects sales tax in states where online tax collection laws apply to remote sellers. We have determined that we meet the minimum thresholds for either number of sales or annual sales amounts in these states, so we will be complying with the law in such states. The purchases you make from ComplianceSigns, Inc. may be subject to use tax. The purchase is not exempt from use tax merely because it is made over the Internet, by catalog, or other remote means. States may require purchasers to report all purchases of tangible personal property that are not taxed by the retailer and remit use tax on those purchases. Each state has separate reporting requirements to remit the proper amount of use tax. State and local tax rates are subject to change at any time. Shipping charges may also be subject to tax in applicable states. Tax will be refunded for returned items. Beginning in 2018, many states began requiring state sales tax collection from Internet sellers. We now collect sales tax on all transactions where the buyer's billing address and shipment address are in these states: California, Colorado, DC, Georgia, Hawaii, Illinois, Indiana, Iowa, Kentucky, Louisiana, Maine, Maryland, Michigan, Minnesota, Nebraska, Nevada, New Jersey, New York, North Carolina, North Dakota, Ohio, Oklahoma, Pennsylvania, Rhode Island, South Dakota, South Carolina, Utah, Vermont, Washington, West Virginia, Wisconsin, Wyoming. If you are tax exempt and are shipping to a state where we collect sales tax, you may complete your order, and email us at salestaxcerts@compliancesigns.com. We will refund the sales tax as soon as we have the appropriate tax certificates. Tax Exemption Refunds can be applied within 30 days from order date. Notify us as soon as your order is placed to assure that your refund is applied. If you would rather order without paying tax, please email us at salestaxcerts@compliancesigns.com or call 800-578-1245 and we will place the order without tax once we have the appropriate tax certificates. Open Account terms of Net 30 days are extended to firms requesting an open account. It shall be at ComplianceSigns.com’ s discretion to accept or reject any PO submittal. As a condition for the extension of credit, customer agrees ComplianceSigns, Inc. may request and evaluate financial information from third parties. ComplianceSigns.com reserves the right to report customer payment history, including delinquencies, to credit agencies and discontinue the extension of credit with any firm due to late payment or changes in business conditions. ComplianceSigns.com reserves the right to cancel terms with any firm due to late payment or process delays. Orders are processed in order they are received. Normal processing time is two business days. If for some unforeseen reason, an item is no longer available or will be backordered for an extended period of time, you will be notified immediately. Upon verification and approval of payment, merchandise will be shipped out as soon as possible. Shipping times represent the time it normally takes your package to arrive from the day we actually send it out, not from the day you submit your order. Processing and shipping times exclude Saturdays, Sundays, and holidays. IF YOUR ORDER IS ESPECIALLY URGENT, WE STRONGLY RECOMMEND CONTACTING US DIRECTLY SO THAT WE MAY EXPEDITE SHIPPING. Note: Your receipt of an electronic or other form of order confirmation does not signify our acceptance of your order, nor does it constitute confirmation of our offer to sell. ComplianceSigns.com reserves the right at any time after receipt of your order to accept or decline your order for any reason. We may require additional verification before accepting any order. ComplianceSigns.com uses UPS as its primary shipper. Transit time is dependent on the level of service selected on each order. ComplianceSigns.com is not responsible for delays in shipping due to weather, mechanical failures, typographical and/or transcribing errors, and others factors beyond our control. IF YOUR ORDER IS ESPECIALLY URGENT, WE STRONGLY RECOMMEND CONTACTING US DIRECTLY TO EXPEDITE SHIPPING. Contact our Customer Service Department if an alternate shipping carrier is required. For larger items that ship via Common Carrier, ComplianceSigns.com will make assist in shipping arrangements. All orders ship F.O.B. Chadwick, Illinois. All packages are insured when they leave ComplianceSigns.com. If a package is damaged or lost in shipment, you should inform the carrier. ComplianceSigns.com is not responsible for merchandise damaged in shipping. Please call us to expedite replacement products, should you require rapid response. You may cancel your order for any reason, and receive a full refund provided your order has not been shipped. If you want to cancel your order with us, please do so quickly, most of our products are shipped within 3 to 5 business days. You must receive a confirmation of your cancellation either over the phone and/or by email for it to be "officially canceled". If you need to make changes to your order or shipping address please call our Customer Service Department. Once an item has shipped, the terms of our Returns policy will take effect. We cannot accept any return or exchange without prior authorization. We can only honor return / exchange requests made within 30 days of the original ship date. Replacement: If your signs / labels arrive damaged, defective, or incomplete, please give us the opportunity to replace them with new signs or labels at our cost. If we are unable to fix the issue, we will refund your money (including shipping and return shipping) promptly upon return of the affected product. Exchanges: We will exchange items purchased from us for products of equal value. You are responsible for shipping costs on the new product and return shipping on the existing product. If new products are sent before we receive your return, we will issue credit for the returned product promptly upon receipt. Returns: We will issue credit for returned product promptly upon receipt. The returned items must be in undamaged condition and suitable for resale. Shipping costs on the original order will not be refunded, and you are responsible for return shipping. Returns shipped “freight collect” cannot be accepted. Email sales@compliancesigns.com or call 800-578-1245 to authorize any return or exchange. All products are warrantied by ComplianceSigns.com® to be free of defects in material or workmanship, at the time of shipment. ComplianceSigns.com liability shall be limited to replacement of the product, if it can be determined that the product was defective at the time of shipment. Defective products, subject to the inspection by ComplianceSigns.com, will be replaced or repaired on a no charge basis. Damage caused by, accidents, or improper use, is the responsibility of the Buyer. ComplianceSigns.com is not responsible for misuse of the products, or if the Buyer is unable to use the product. This warranty is in lieu of any other warranty expressed or implied. All shipping costs related to returning the product to the Manufacturer for inspection will be prepaid by the buyer. Shipping costs will be reimbursed if parts are determined to be defective. Shipping non-defective parts back to the Buyer will be paid by the Buyer. All expenses, losses in revenue, and labor charges arising or originating from the failure of defective parts will be borne by the Buyer. The requirements for sign content are determined by intended use and by applicable regulation. BUYER is responsible for determining the appropriate content for a sign. ComplianceSigns.com makes no warranty or representation of suitability of a sign for any specific application. Review our Compliance Resource Guides.